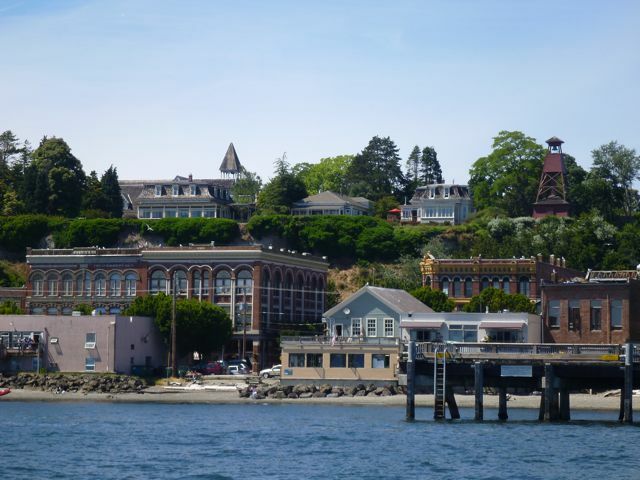 Goodbye Port Townsend, Hello Pacific! Big seas and winds for part of the voyage made things challenging. 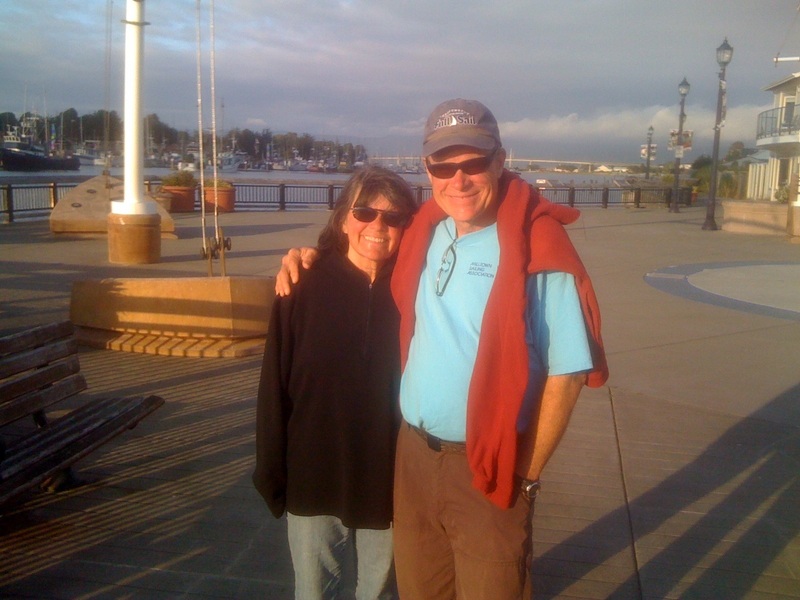 A Rough Corner Turned: We are in Eureka, California, resting up after 8 days at sea, two of them hove-to in a gale. Heaving-to is what you do when you want to ease the boat’s motion and just “park” it on the ocean. More about that later. Nothing like a good landfall and 14 straight hours of sleep to put things right again. 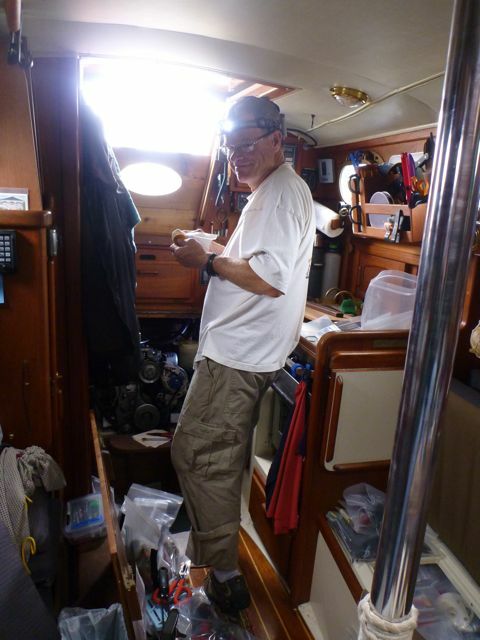 Stowing stuff in the forepeak before departure, to make room for sails on the V-berth. Departure: The weather window for our departure from Neah Bay apparently closed soon after we left. But while we were there in rainy Neah Bay, happiness seemed to wash over this Indian village at the outermost reaches of the country. While Jim went fishing and Karen contemplated the sky, a rainbow appeared to the east, arcing all the way from Waadah Island to the mountains. Three Makah canoes were paddled with gusto across the anchorage. Later, in foggy twilight, a chorus of male voices sang tribal songs. Sockdolager in Neah Bay awaiting good weather. Note new weathercloths to block spray and wind. It was a memorable evening, and next morning a Makah man in a traditional red felt jacket and straw hat climbed over breakwater rocks to sing to the fleet of moored boats. His voice wove a spell among the fishing fleet, his songs coming to rest on boats with romantic names such as Memories, Roamer, Last Watch, Silver Foam, Deeahks, Makah Maid, and Valorous. And his songs reached my ears as I walked the dock, so I stood still and listened with the greatest respect, to something I did not fully understand but knew was good. To top off a great stay in Neah Bay, the crew of the emergency response tugboat Jeffrey Foss gave us a grand tour and a couple of Foss ball caps. 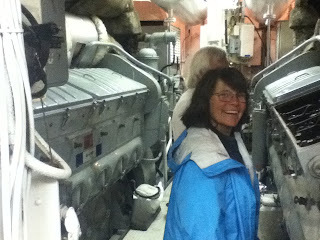 Chief Engineer Ted shows Karen the inner workings of one of two engines that can generate 4300 horsepower. This was followed the next day by another grand tour of the new tug that replaced it, the Delta Lindsey. Cap’n Arch, Chief Engineer Ted and the crew are on call 24/7/365, in case a big ship ever loses power, and the Lindsey’s 6800 horsepower is a first line of defense against oil and chemical spills, and shipwrecks. The Jeffrey Foss left for her next assignment while we were touring the Delta Lindsey (click here and see page 10.) As we left Neah Bay, the Delta Lindsey was just outside the harbor, and we waved goodbye to a talented, dedicated crew with a great sense of humor. Foss rules, guys! 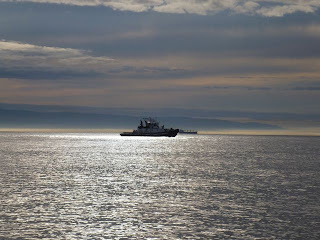 Delta Lindsey silhouetted against a calm sunrise in the Strait of Juan de Fuca. As we prepared for this passage, the knowledge weighed heavily that this stretch of big water along the Washington, Oregon, and Northern California coasts is labeled by pilot charts as the most gale- and high-wave-prone area in the entire North Pacific. 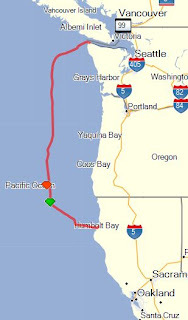 Our route from Neah Bay to Eureka, where we are now. The red mark indicates where we stopped to heave-to, and the green shows where we resumed our course. Since it was our first time across, we can’t tell you if the conditions we encountered were typical or not. 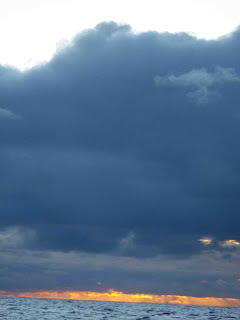 But most knowledgeable people are saying 2011 is an extraordinarily stormy year. The seasons are a month late, say others. We believe it, but can also report that this was a good passage, reasonably sailed with no breakage or damage to either boat or crew. 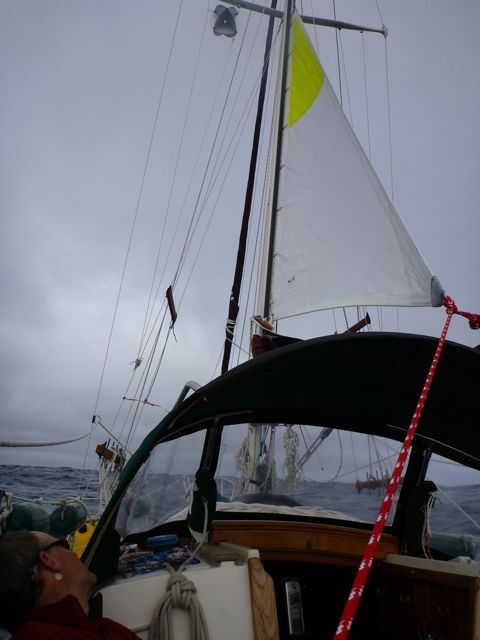 We mostly stayed about 100 miles offshore, in deep water away from the continental shelf and the weather influences of land. Our dodger gives good shelter. What makes a good passage? 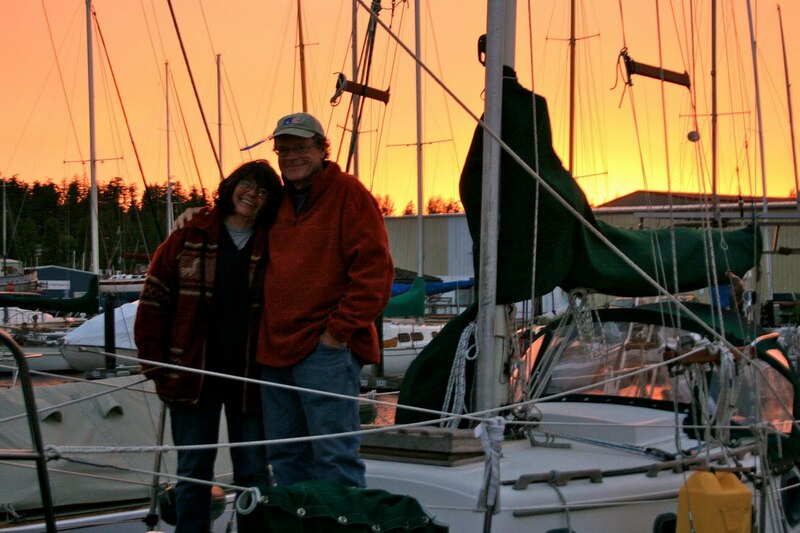 Although Karen learned to sail in the mid 1970s and Jim learned in the mid 2000s, we are equals at sea. This goes to show that it doesn’t always matter how long you’ve been sailing, it’s how much you’ve learned, and how well you apply it. Both of us have read every book and magazine article we could find on the subject of sailing and all its nuances. We bring different but equally important skills to this partnership. Both of us have practiced our skills solo and as a team, as often as possible. And while Karen had the chance to experience sailing before electronic navigation or digital instruments, vivid memories of being utterly lost in thick fog and praying for someone to please hurry up and invent a little black box has given an edge to her appreciation of modern electronics: we can count on them until they fail, which eventually they will. 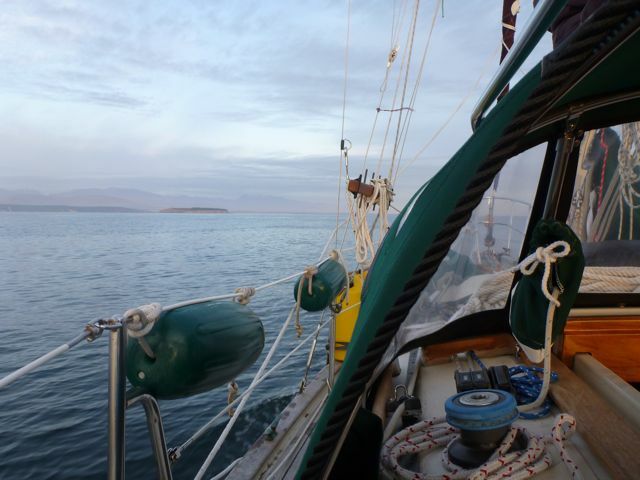 But good seamanship skills are fundamental, confidence-building, and ever-evolving. You never stop learning, and no one is overqualified to go to sea. Jim checks the engine prior to departure. 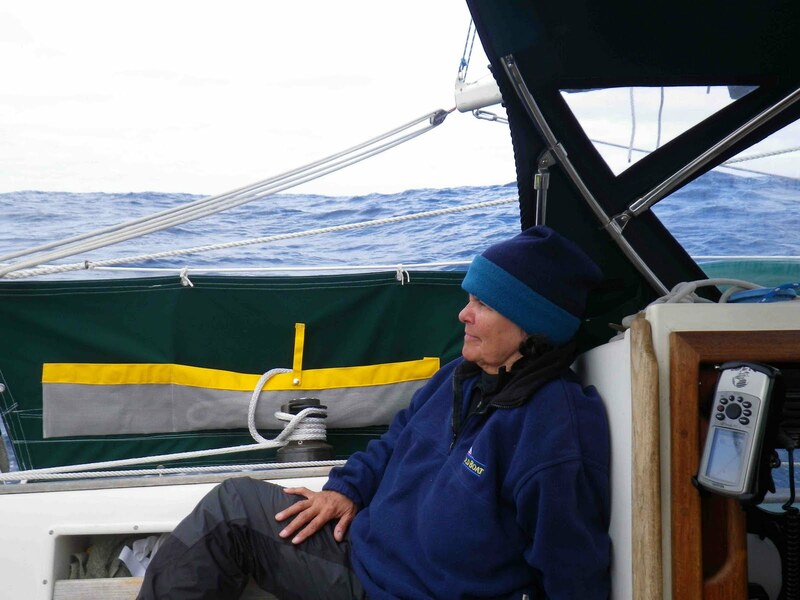 There are many sailing heroes to emulate, but the ones Karen remembers most fondly from her early learning days were the ones who made good, long passages, the kind she wished she’d been on. They were Eric and Susan Hiscock, Miles and Beryl Smeeton, John Guzzwell, Bernard Moitessier, and that young upstart couple named Lin and Larry Pardey on that improbably tiny boat of theirs, Seraffyn. In sailing’s celestial firmament, these people were the stars that the rest of us in those days navigated by. Their calm seamanship and unflappable humor inspired a generation of new sailors, who understood that following in their wakes was a good course. But the best description of a good passage that Karen ever read in books written by these sailors was also the briefest. One word, in fact. It came from the late, laconic Eric Hiscock, whose highest accolade after crossing 3,000 miles of ocean was that the passage had been “uneventful.” Whoa! Uneventful? 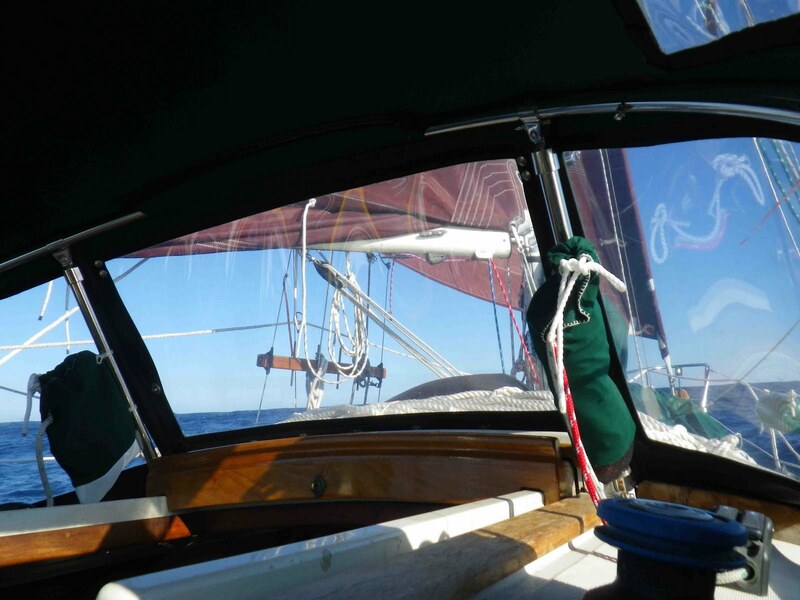 This one word revealed a sublime concept: that with the right combination of preparation, seamanship and care, ordinary people like you and me can, if we want to, self-reliantly sail serious distances across oceans in small ships, uneventfully. It was both a revelation and a caution. Sunset at sea, wind coming. 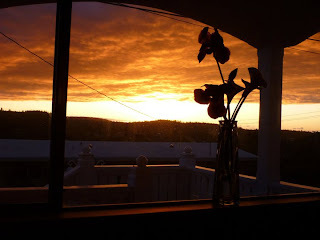 It’s hard to write this blog post because we don’t want to overemphasize or gloss over the difficulties we encountered, or make you think this was a walk in the park, or brag, or sound smug, or like we barely escaped with our lives. The Scopolamine patch Jim wore didn’t prevent an awful day of seasickness followed by three days of nausea. Karen experienced the nausea for several days, plus bruises from small stumbles. There was some raw fear at the thought of being at the mercy of a sea bent on giving you a gale, and a hazardous sea warning too late to escape from. Eleven to thirteen foot waves as forecast would be okay, but only 8 seconds apart is not. These are breaking seas, and after you secure the boat hove-to for the night and go below, you listen to them crashing into the hull, punching like prizefighters. In the night a few of them send you over on your side and you feel fear, but also confidence that this stout little boat will come upright again. 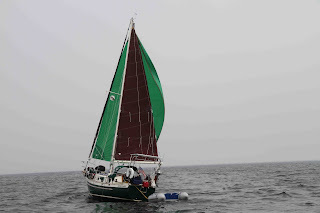 First reef in a process that led to a second reef and eventually the storm trysail alone. The extreme motion of a small boat in big seas requires vigilance, or you’ll be thrown against a bulkhead. Closest comparison: Think of getting into a small capsule and throwing yourself into a washing machine on agitation cycle for 8 days. We took movies, but are still getting them organized. Plus the connection isn't as good as we'd need to upload them now, so later on we'll have a "movie night" post. More comparisons: Cooking a meal in a gale when it’s blowing 35 knots and seas are “hazardous” is a form of juggling. Almost impossible until non-jugglers develop a system for handling one thing at a time, because the minute you set anything down it’s going on a wild roll around the cabin. Snacks become mini-meals until one evening you get tired of stupid granola bars and fruit leather, and you cook something simple, hot, and served in a bowl. Boil some water in the kettle, but don’t let it spill or you’ll be dealing with a burn. Dump some instant mashed potatoes and a can of string beans in a pot, and pour the water in, but wear a mitt so splashes can’t burn your hand. It smells utterly ambrosial. Stir the whole mess, spoon it into bowls, and eat like kings only wish they could, sitting in the cockpit in the middle of a wild sea on a beautiful night that few ever get to witness. Every cell in you is humming with life; even your nauseated mitochondria. Storm trysail in use, we're hove-to in 30-35 knots here. Still more… we knew from the medical training that dehydration is a constant threat, but who wants to drink or eat much when it means you’ll only end up having to go below to ride the wild toilet? (Peeing over the side is one of the most commonly reported ways men fall overboard, so not a good idea.) Drink you must, and from bottles that have narrow openings so you don’t dump it down your neck. We each monitored our own fluid consumption, and made sure we nibbled enough variety to cover basic food needs. Staying out of that kind of trouble is a duty, not an indulgence. After four days Karen wanted to yell “Stop that!” to the crazy corkscrewing motion brought on by increasing wind and wave. Night watches were a 3-hour struggle in cold damp mist to stay awake and alert, followed by 3 hours of sleep and another watch. Anything that required working belowdecks—updating the navigation, ship’s log, or checking in on the Ham radio Pacific Seafarer’s Net—was a recipe for more seasickness. Black-footed albatross. 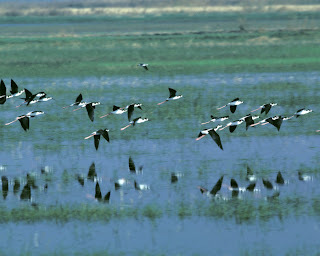 Photo courtesy of U.S. Fish and Wildlife Service. 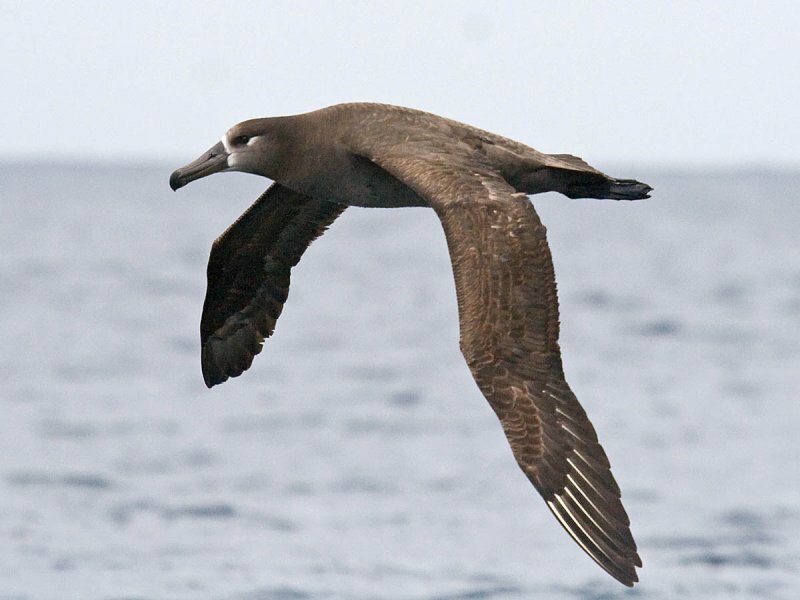 But oh my God, the things we saw… more black-footed albatross than we could imagine, swooping by on 6-foot wingspans and gazing at us with large dark eyes; shearwaters and northern fulmars skimming wavetops; and acrobatic storm petrels, so fragile and graceful you could weep. 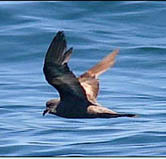 Ashy storm petrel. Photo courtesy of U.S. Fish and Wildlife Service. Other gifts... a bioluminescent wake glowing behind the boat like a heavenly scratch. Crystalline blue water just behind the white foam of breaking waves. The gift of a starry night like nobody on land ever sees, with the Milky Way so clear and close it makes you gasp at the thought of your own mortal molecules of billion year-old stardust, rented for a few decades, being so very transient. And finally, there is a getting used to, an accommodation, an acceptance, of the motion, the uncertainty, the flow, to the point where none of that bothers you much anymore (but you still do pay attention to weather forecasts.) And you realize then that you could live out here for a time, and not be such a queasy foreigner. There are plenty of prosaic things that could define what makes a good passage, starting with the uneventful: no breakage or damage, no major screw-ups, no horrendously scary incidents. But that’s just the start, and in the 1970s Eric Hiscock no doubt knew it, too. If living lightly on the planet while living one’s dream—whatever it may be—is judged to be an abandonment of responsibility or of one’s usefulness in the workaday world, then we have abdicated our core values and embraced the distracted, dreamless, functional insanity of these times. 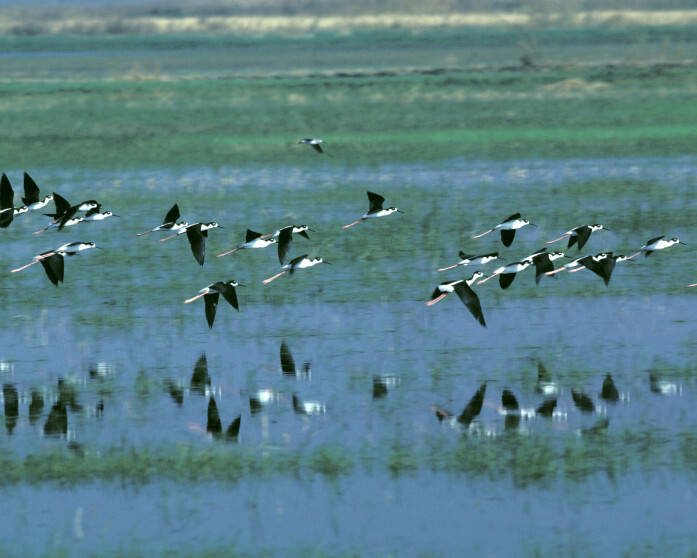 There’s a reason all this rich birdlife is here: someone decided to make the most important habitats of Humboldt Bay a National Wildlife Refuge instead of developing it. Photo courtesy of U.S. Fish and Wildlife Service. More on Heaving-to: It’s a passive tactic for riding out storms, or getting some respite from the more violent motion. The idea is to reduce speed and thus discomfort, so that the tired crew can rest, cook and eat a meal, change sails more safely, or do intricate task-work like connecting to a Ham radio net. Heaving-to does not stop all movement, though; if your boat isn’t at an optimum 45 or 50 degrees to the wind, it can become a target for breaking waves. In our case, the boat stayed more broadside than angled to the seas, and a number of them clobbered us, breaking over the entire boat. 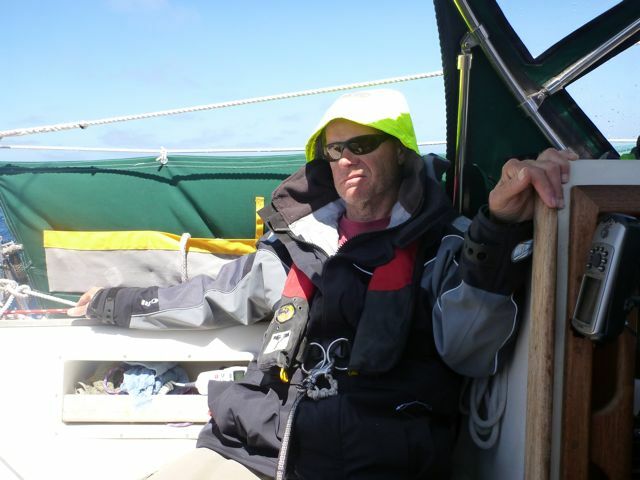 During the two days we were hove-to, Sockdolager was shoved 60 miles to leeward. 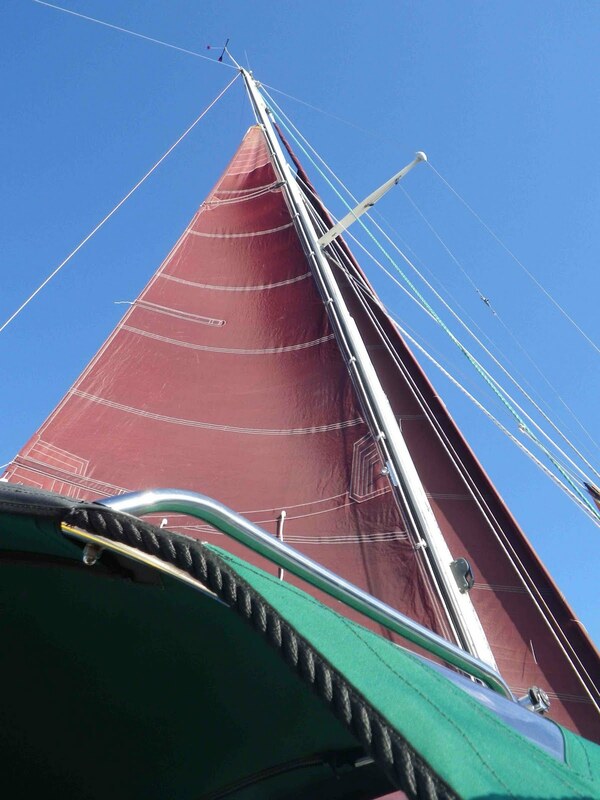 That, we learned, is not acceptable, and in a call with Carole Hasse, our sailmaker, we went over options for making the boat heave-to at a better angle to wind and wave. We’ll try a couple of new things and keep you posted. 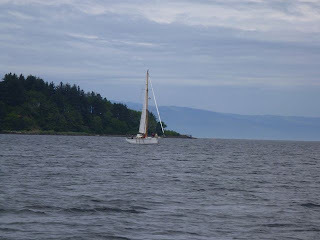 Meanwhile, here is a description of the passage and the heaving-to process, in Jim’s words: We motored out of the Strait of Juan de Fuca then flew the drifter in light winds through the day. The drifter kept us moving in the early stages where we were wishing for more wind. Be careful what you wish for. 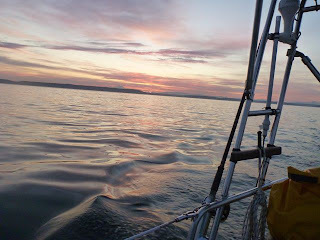 In the evening the wind died so we motored through the night. The wind picked up in the morning and we had a great day of sailing in sunshine and blue skies. As we continued over the next three days the wind gradually picked up until we were double reefed, sailing at about 4kts in moderate sea. We were too far offshore to get weather on the VHF, and I was too seasick to go below to work the SSB until the 5th day, when I'd gotten used to the motion and felt OK. So on the morning of the 5th day, off the southern Oregon coast, we decided to heave-to, take a break and get a weather forecast. What we learned was that we were heading right into a 40kt gale off Cape Mendocino. Wind speeds are often forecast a bit lower than reality. Where we were at was also under a gale warning as well as a hazardous seas warning. Hmmm, we thought, this is interesting. Jim, wishing the weather forecast was not quite so interesting. We ended up being hove-to for two days. We were under storm trysail with no jib/genoa. 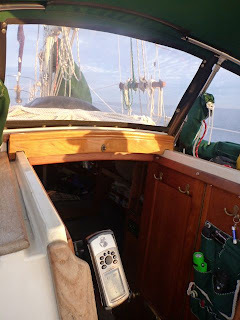 The boat was mostly beam on to the seas; oscillating between heading a bit into the wind, beam on, and sometimes a bit stern-on to the wind and seas. Speed was about 1.5 kts mostly to leeward on a beam reach. We did observe the slick to windward that is expected when heaving-to. But the motion was extreme. Seas were at least 10-12 feet with breakers, and wind was gale force. We have no way of measuring wind speed, but estimate it at 35 knots and probably no more than 40 in gusts. We got hit by breaking waves perhaps a dozen times. They broke right over the entire boat. Several times it felt like the boat was going over, but she never did. Karen, wishing the weather forecast didn't include hazardous seas. 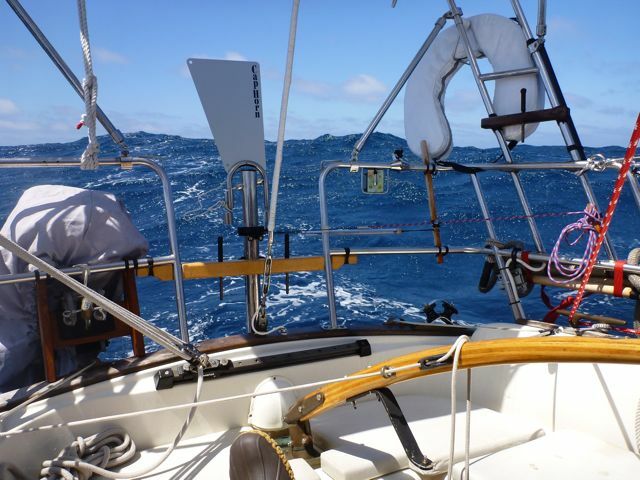 After two days the forecast to the south was better than where we were (still 30kts). 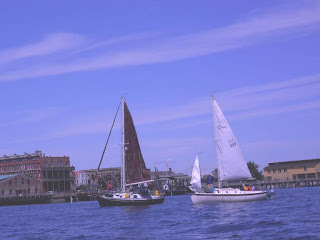 So we kept the storm trysail up, and a little bit of the genoa, and sailed for about three hours in those big seas under bright blue sky, into calmer waters. That night the stars were crystal clear and the wind and seas were fair and much reduced. Looking at the extended forecast we saw more gales predicted, so instead of continuing on to San Francisco, we made landfall at Eureka. Feeling the need to be able to do a better job of heaving-to, we called our sail maker, Carole Hasse, Port Townsend Sails, and had an extended conversation about having her make us a backstay-sail similar to one she made for EOS, another Dana 24. That boat’s arrangement has not yet been tested in heavy weather. 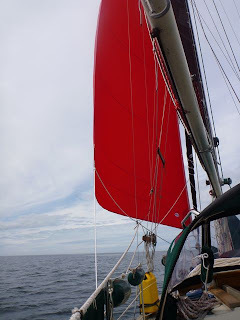 This sail would fly off the backstay, with the clew coming forward. There would be no mainsail or trysail flying. This will hopefully provide enough windage aft to force the bow more into the wind. We found that raising the storm trysail in the lee of the double-reefed mainsail made sail handling much easier, and reversing the process when the wind eased also worked well. Hasse also brought up the likelihood of needing a decent sea anchor for such conditions, and we are concerned about where to store such a bulky item as an 8-foot diameter parachute and all its necessary gear. 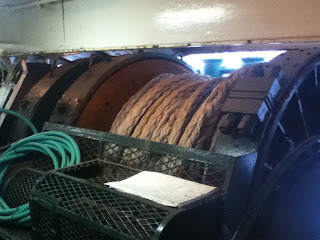 So, no, the Dana doesn't seem to heave-to very well. But to have taken such a beating with no damage or a knockdown, I'm still very happy with this good little ship. Next time we’re on a long passage we’ll probably join the roll call on the Pacific Seafarer’s Net, a Ham mobile maritime group. Our call sign is KF7OWV, and you could follow us here. Finally, a little note to our dear friends and riggers, Brion Toss, Gordon Neilson, and Alison Wood... in terms of rope strength, we found the Holy Grail: Plasma line. Breaking strength, one million pounds. Dudes, tugs are so cool. We arrived this afternoon in Humbolt Bay, CA. Somewhat short of our original goal of San Francisco due to a pesky 40 kt gale predicted to be directly on our path to SF. More to come once Karen gets some sleep and fires up her computer. We have been hove-to for two days in a gale off southern Oregon. About to continue on with this excellent adventure. All is well. We are currently 150 miles NW of Cape Mendocino. All is well. We are still in Neah Bay. There's a Low sitting right atop the Strait entrance, with adverse winds and lots of rain. Forecast looks better for a Sunday morning departure. Keeping our fingers crossed! Photo by Elizabeth Becker of Seaport Photography. 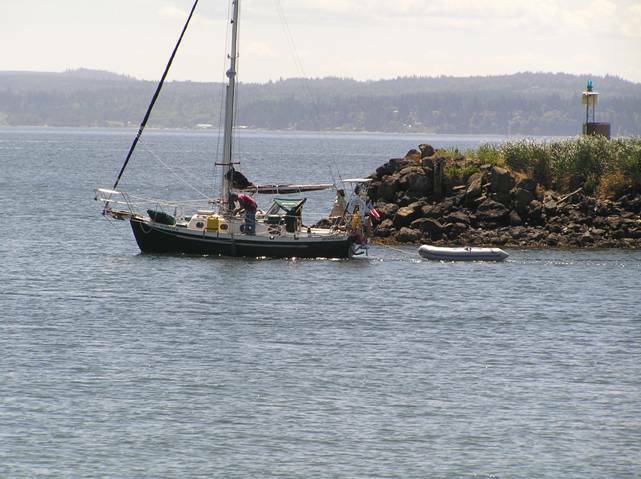 Sockdolager leaves Boat Haven in Port Townsend. Photo by Joan Zimmerman. If you look at a map of the furthest upper left-hand corner of the United States, you’ll see where we are: Neah Bay, just inside Cape Flattery at the entrance to the Strait of Juan de Fuca. 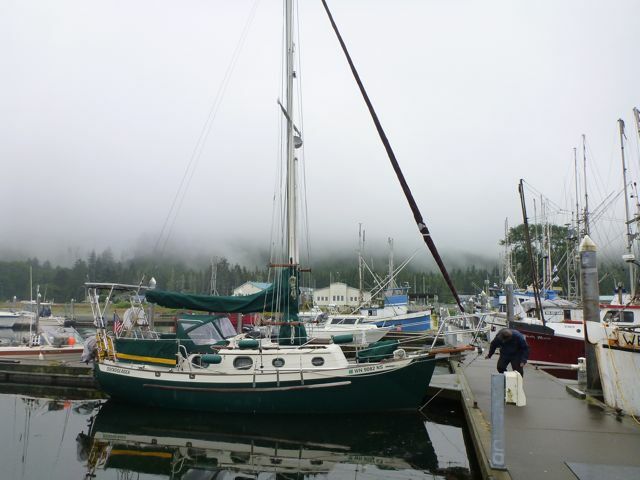 We might even be able to claim that as I write this, Sockdolager is likely the furthest west anchored boat in the Lower 48! Instead of dawdling, we decided to take advantage of a break in the winds and scoot out here. 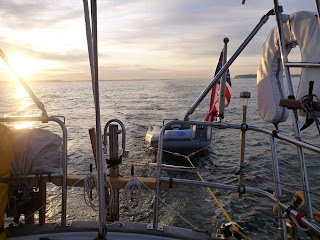 We left Port Townsend at 0415 on an ebb and motored in a straight line to Port Angeles, arriving to anchor before the afternoon westerlies made things unpleasant in the Strait. 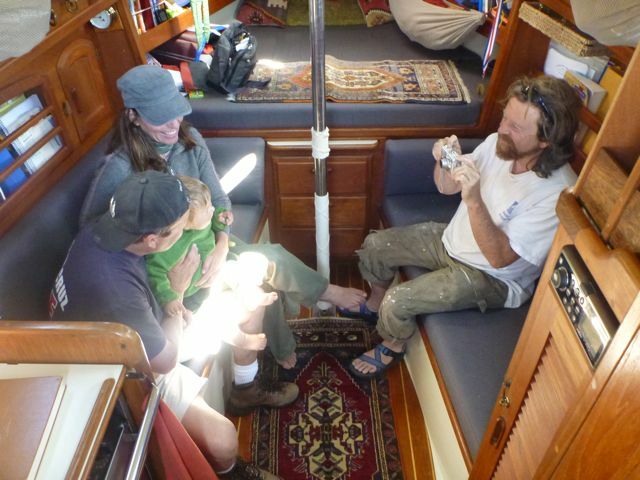 Bertram Levy and his family arrived within an hour, aboard their lovely wooden cutter, Able. 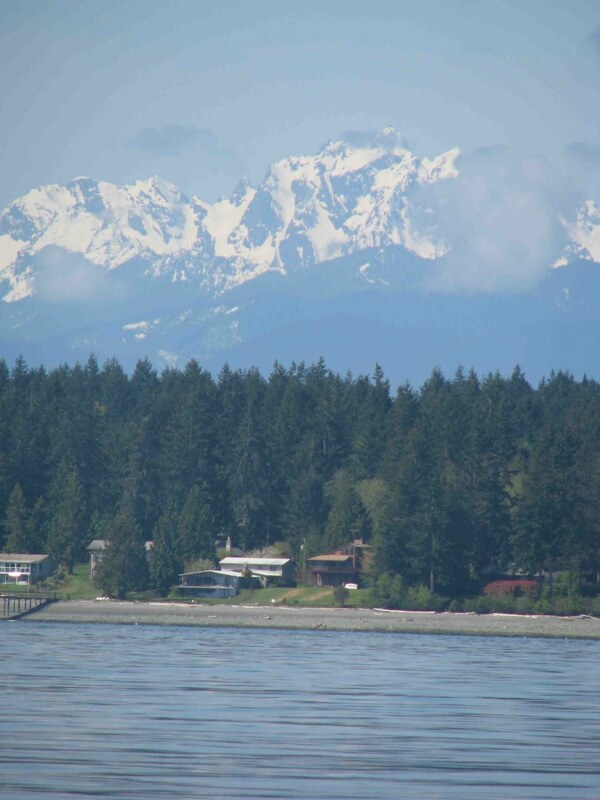 They’re enroute to Barkley Sound in Canada. After enjoying a brief visit with them, we napped and then arose just after midnight to slog down the Strait into headwinds and seas, but on a fair tide of two knots. Able sailed into Neah Bay a few hours later. Able anchors in Neah Bay after a long day. 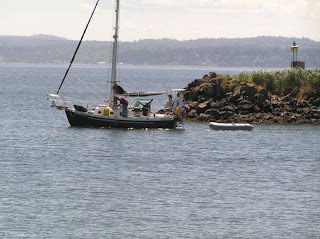 From Neah Bay we succeeded in sending a quick post to the blog via Ham radio; when you see our names as senders, as shown in the previous post, it’s coming from our radio. It’s a complicated process, and transmissions tend to give Sockdolager a power surge that sets navigation lights to flashing and bilge alarms to squealing. Jim installed a few ferrite chokes (Ham geek-speak) on wires and it helped, but there is still more ferrite choking needed. It’s hard to describe what it feels like to deliberately turn your life upside down and leave home on a small (some say too small) boat for a sea-voyage of unknown duration, to fabled tropical isles. Not the usual thing on most been-there-done-that bucket lists. The act of leaving can be uncharted territory. There were so many feelings swirling on those last days in Port Townsend—excitement, exhaustion, happiness, twinges of sadness, love for dear friends, celebrations, a little worry, and a slowly dawning “We did it!” high-fived in the cockpit once underway. 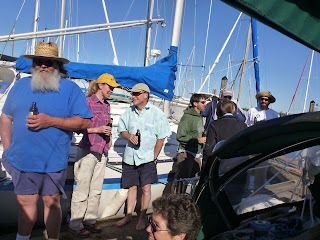 There was the July 4th Mother of All Dock Parties—friends, nearly 40 of them throughout the day, surprised us by coming from as far away as Portland, Oregon and Alaska, as well as nearby. 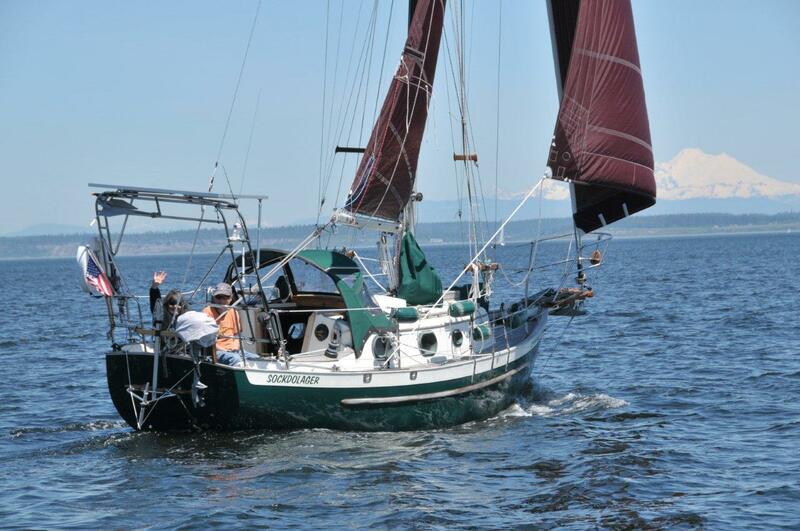 At one point Sockdolager’s bow pointed saucily skyward as 14 people lounged and chatted in the cockpit, on the foredeck, and down below—a new record for this 24-footer. And we never ran out of beer, either! The dock party went from 2:00 to 8:00 PM. Little Orion gets his photo taken. 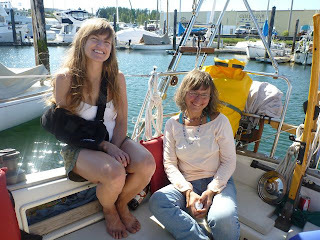 Our friends Kristen (shown, in sling) and her husband Lou flew their own plane to PT from Spokane via Alaska, to say goodbye; Yvonne (at right) expressed a longing to go back to living aboard a boat. There were good wishes, via dozens of emails, for a bon voyage. There was our collective “Whew!” once both trucks were sold the next day and insurance policies cancelled. There was this “What are we forgetting?” inability to stop being a couple of stressed-out walking lists. 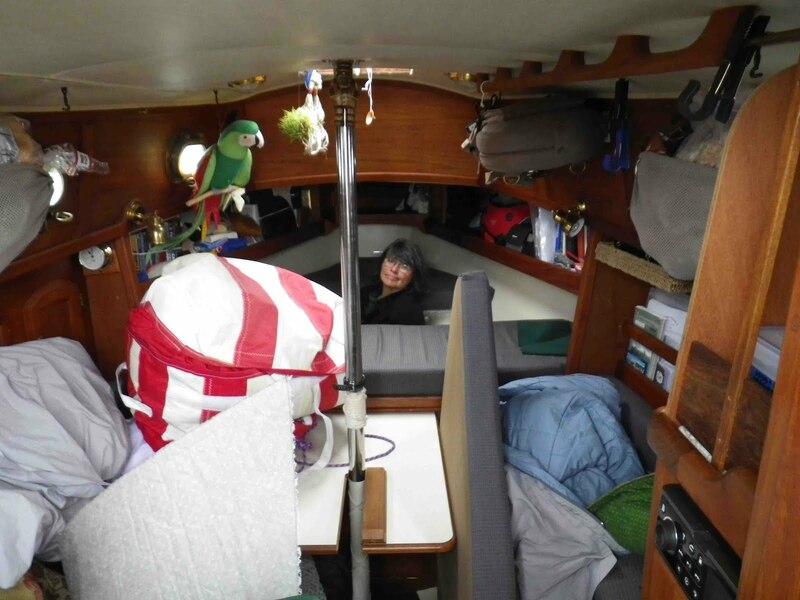 And then there were gales—four days of hard worrisome wind that kept us at the dock longer than we’d anticipated. That became a good thing, because we were far more tired than expected. 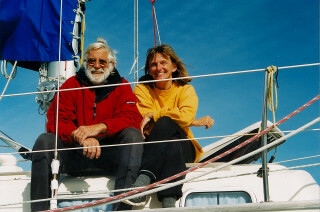 There were friends Klaus and Maria, two circumnavigators who’ve rounded Cape Horn (wow!) giving us the honor of casting off our docklines, tooting a fabulously loud horn as we left. Klaus and Maria aboard Ludus Amoris. Photo courtesy of Klaus & Maria. 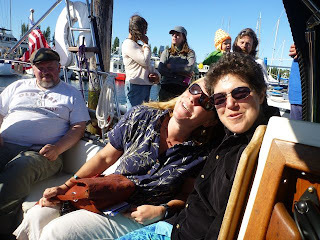 There were Lon and Joan and a posse of camera-toting friends in three boats, who snapped away as we sailed merrily back and forth together in front of Port Townsend. 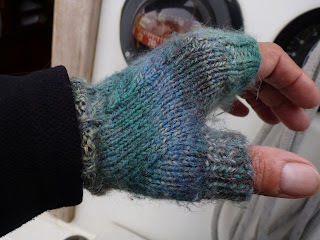 Sockdolager and Selkie sail together. Photo credit: S/V Blackfin. And there was Port Townsend herself, dressed in the finest blue sky with a lace cloud collar, beguiling us one last time in the alpenglow of a pink sunset that reflected off the Cascades. What a sendoff! Always look back: Somehow the advice “Never look back” has become part of the lexicon of leaving. We do it anyway. When you get underway at first light and the waterfront is still sleeping like a plein air watercolor, you’d be crazy not to look back. When sunrise over the Cascades bounces off the Olympics and colors your westbound wake a spectacular pewter-pink, you must look back, because it’s one last message: Don’t forget where your home is! We won’t forget, and we promise to keep in touch while we wander. Arrivals, too: There are, of course, a few arrivals with every departure. The arrival of constant motion into our lives. Unlimited horizons. We welcome the sight of morning rafts of seabirds—rhinoceros auklets, puffins, common murres, and marbled murrelets—foraging for breakfast, giving little wing flips to dive and “fly” under water. We rediscover how extraordinarily good simple food tastes at sea. We welcome lungfuls of clean salt air, watch a wall of fog stay politely on the Canadian side of the Strait, hit the pillow tired in the evening, and cheerfully arise at midnight to catch a speedy ebb tide. Goodbye, Discovery Bay and the Olympics. 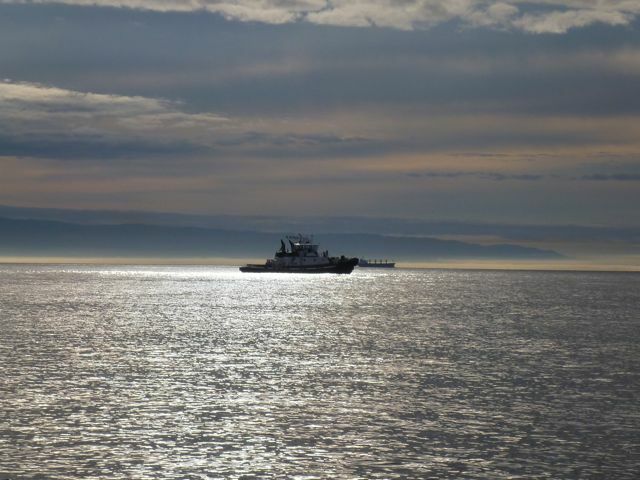 Now the final preparations for an offshore passage are being made at Neah Bay. San Francisco is over 700 miles away, and it’ll be the longest passage we’ve done together. 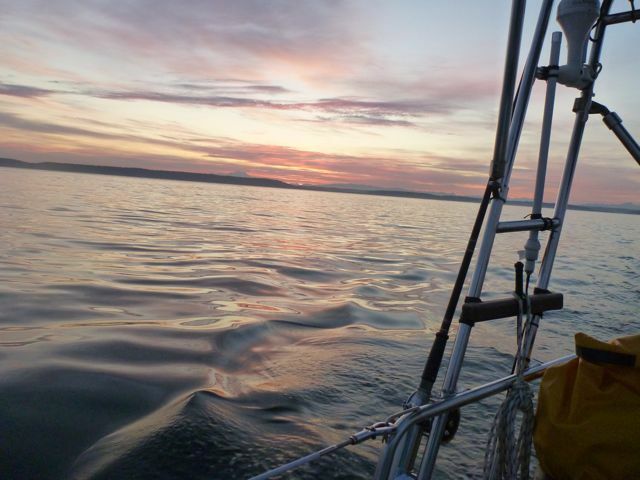 This is the time for attention to details: secure lifelines, lockers, hatches, anchors, check the engine, rigging, sails and safety gear, go over the navigation and sailing directions, put quick-to-make foods in easy reach, make up the sea-berths, and more. When the weather window arrives, we’ll go. From the looks of the weather, conditions may be right on Friday or Saturday. 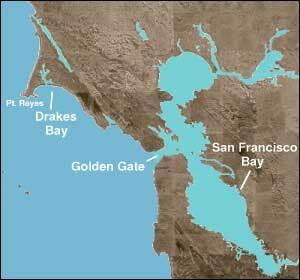 It should be a 5 to 10 day passage (about 750 miles) and we’ll stop at Drake’s Bay, 26 miles north of San Francisco, to rest before attempting to enter the big city. Alaskan friends take note: We have located the Bridge to Nowhere. 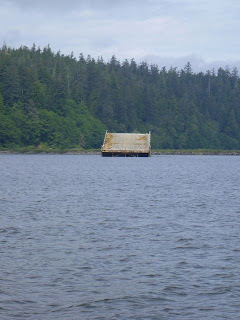 It’s in the NW corner of Neah Bay, and seagulls are lovin’ it. We have arrived in Neah Bay. More to come in a day or two. The ties that hold us now are the flexible and forgiving kind—friendships—that will stretch around the world if need be. Those are the most precious ties, and are the ones that will one day bring us back home. Meanwhile, WOOOOOOO-HOOOOOOO! Thoughts of our first major stop, San Francisco, are becoming more frequent. Hopefully it'll be a good first offshore passage. It's no exaggeration to say making such a transition as this is a test of one's sanity. Jim (after viewing this video): Hey! San Francisco’s hosting the America’s Cup in 2013 and they're racing each other right now! Jim: We could race them! Jim: I think we could take them. Karen: Yeah. 5 knots against their fifty. That’s lessee, ten percent of their speed. 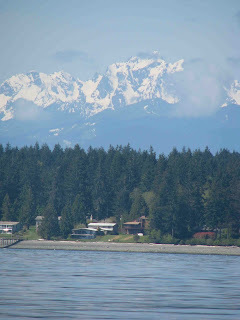 Getting nostalgic about the lovely Puget Sound views. We'll miss sights like this but oh the views to come! 1. Once you leave, stop thinking about what's next. –Randall A. 4. Focus on the fun. –Alison W.
5. Remember that wherever you go, there you are. --Jan H.
6. Rock the boat. --Anna Q. 7. Shiver your timbers. --Kathie M.
8. Keep an open mind and an open heart; listen more; judge less; forgive sooner. –Bob T.
9. Try to stay in water deeper than your boat bottom. --Leif K.
10. Don’t worry about what you forgot. –Yvonne J. 11. Once you head out to sea, turn off all shoreside communications and feel the delight of truly being at sea, letting the sounds, smells and visitas take over your whole mind. –Lin P.
12. "The true peace of God begins at any spot a thousand miles from the nearest land. "(Joseph Conrad) --Kerry H.
13. Have fun. Forget what it was like before; the Now is yours. –Herb & Nancy P.
14. You only live once, but if you work it right, once is enough. –Yvonne & Pete T.
15. Pluck the chicken before you get on the boat. –Chuck Y.
Wow, guys! Thanks. The goodbyes have been amazing. Dancing the night away at the PT Brewery’s outdoor garden with so many friends; Val and Mike’s musicians’ Bon Voyage barbecue; neighbors and friends who feel like family; dinner with Leif & Joan (“Hey, we know you’re too busy to cook!”); an impromptu party with Hasse, Nicki, Ace and Jasper; a few small but very useful gifts; quick visits by friends and family; offers of help (Sandee: “I love love love to pack!”); the worrisome little details that somehow all came together as if being directed by good karma; expressions of love and affection, and excitement for what we’re doing (and some angst.) Oh, and working 'til midnight to make it happen on time. I think we’ll need a few naps. 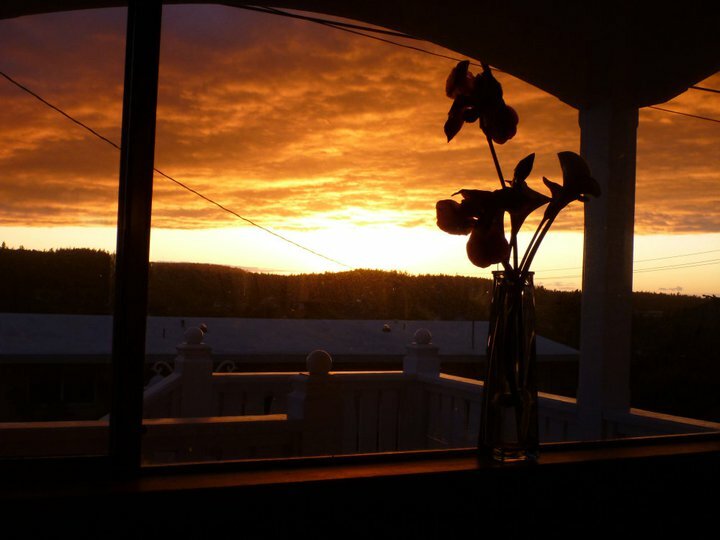 Enjoying a last classic sunset from our cottage on the hill. We’re spending the weekend cleaning the house, organizing the boat, and getting a few provisions. On Monday don’t forget to come down to D dock between 2:00 and 6:00 PM. Then it’s off to the fireworks by car. On Tuesday, it’s the vehicle sales transactions, and then… and then… we’re off! I know from a couple of recent conversations that this news still hasn’t sunk in with some of our less-than-tech-savvy friends, so: Hey! If you’re on our gmail list and expect us to email you every time we post something, we can’t anymore! This will be the last post for awhile in which we can notify you unless you automate it and click on the “Follow” or “Updates From Sea” gadgets on the left side of this page and follow directions. ‘Nuff said. See you somewhere down the ocean road.